To many, dogs are their babies, so why not? 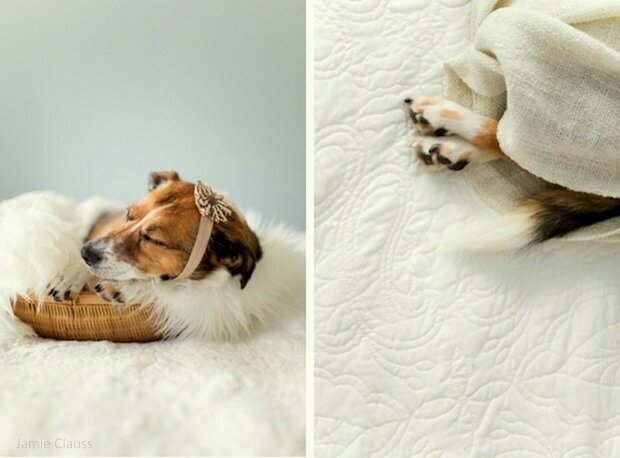 Professional wedding photographers Jan and Chase Renegar don’t have a newborn, but that hasn’t stopped them from having photos taken of their “baby.” The couple did a tongue-in-cheek photo shoot of their precious little rescue dog, Snuggles, and these pictures are better than some of the ones you’ll see of human babies! The Renegars’ friend Jamie Clauss, also a photographer, specializes in family and newborn portraits with Count It Joy Photography. Jan had been admiring a recent photo shoot of her pal’s, and commented that someday she’d love to do that, but she and Chase don’t have any kids yet. 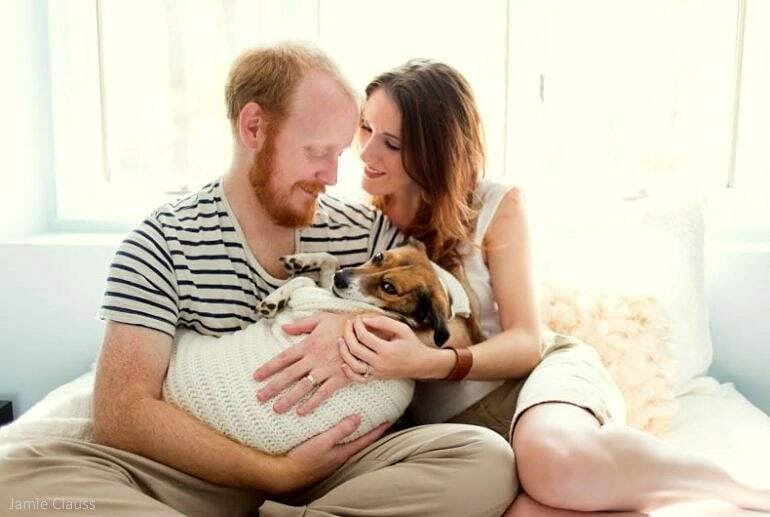 They decided to do all the cliché poses with them fawning over their six-year-old bundle of joy. To many, dogs are their babies, so why not? The photos have gone viral, and opinions run the gamut. While she typically only takes photos of human babies, Jamie says she wouldn’t turn down any “baby-dog” portrait requests. Awesome! 🙂 Love their sense of humor! Absolutely precious! If anyone find fault with this, the problem lies with them! Awwww I LOVE these pictures! Too sweet!!! OMG! This is awesome! I totally understand, my pups are my babies, too. Too freaking cute! These pictures are the best. Love the pictures and the brilliant idea. Those are adorable photos! Snuggles looks so happy. What problem could someone have with them? I only wish I had photos like this with my 3 little babies. LOVE, LOVE, LOVE the photos. 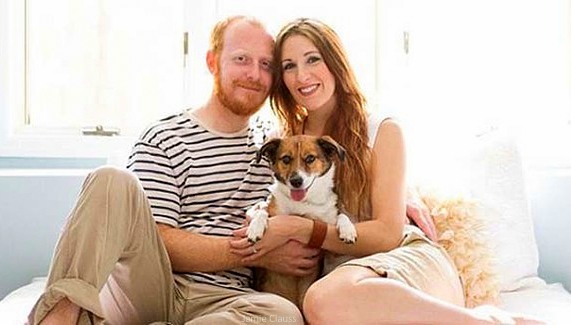 I’d rather see photos of a dog and their family then of any babies. Babies and kids bore me to tears and get on my nerves…dogs and cats..mostly dogs, I love and never get bored with. heehee I like you taxpaying horse! Finally, someone who speaks my language!!! I love, love, love all these photos! 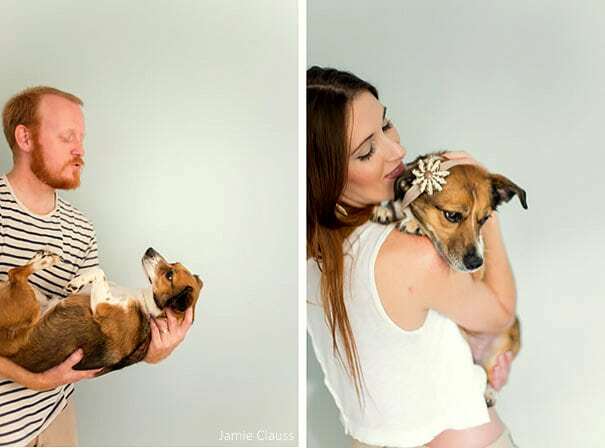 Their little girl is the same age as my Bruno, so I’m really ecstatic about these photos and how the photographer managed to make Snuggles look so “baby” like. I Wish Jamie could photograph mine, but my dog hates getting his picture taken. I LOVE THESE!!!! I have 2 “babies” and they are my life and my loves and they truly are my children. Too cool. What a fun idea! I wish my cats would sit still for a photo shoot. Fat chance! 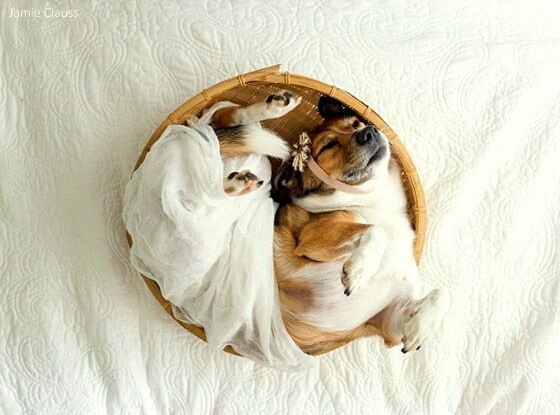 Adorable dog as well. I can see lots of people requesting photographers to do this for them now. OMG! Absolutly adorable. I love love love the one with the feet. I have to say that this is the cutest idea ever. My “fur” baby is my only “child” so far and I am glad to see that some other ppl love their baby as much as I love mine. Very cute! i think this is a GREAT idea !!!!! So cute — and a great idea!! Love these pics!!! 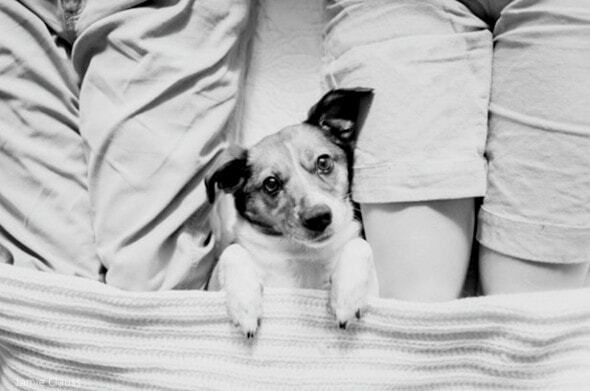 It only shows that our beloved dogs, become members of our family. I refer to mine as my furry babies! Keep doing what you do….heartwarming! Too Cute!!! it’s a good idea. Snuggles looks at home and relaxed. Love It! Thank you for sharing your family pictures. What a very loving, caring and good looking family. 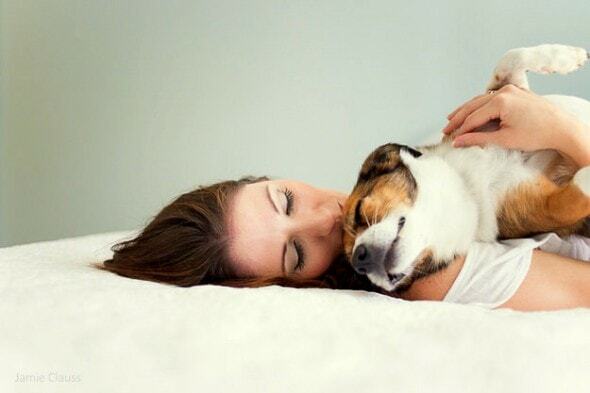 People who are kind and loving pet owners will make wonderful parents. The pictures are great, you two are a lovely and fun couple! Never change. You are a role model for future parents. We need more people like this and this world would be a better place. 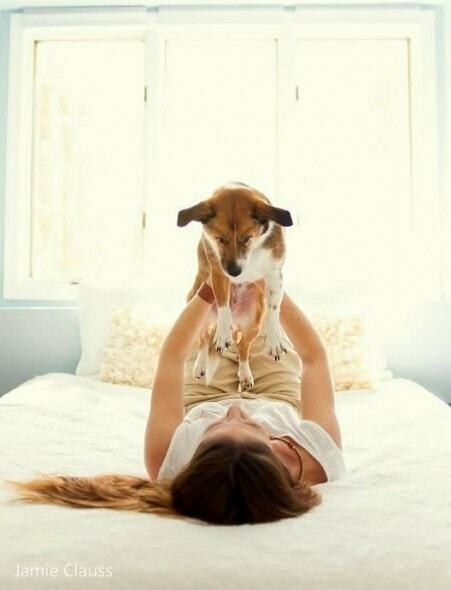 What a lucky dog!! 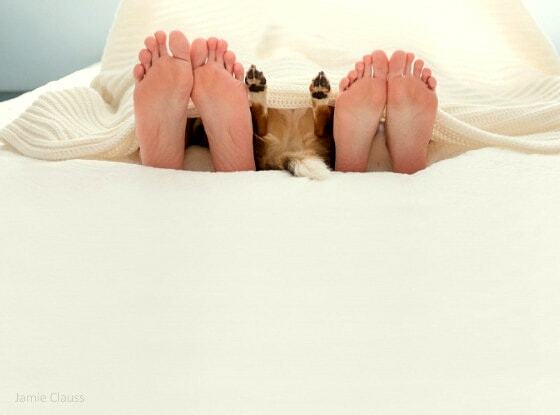 Makes me want to do this with my two babies. Love it!!! 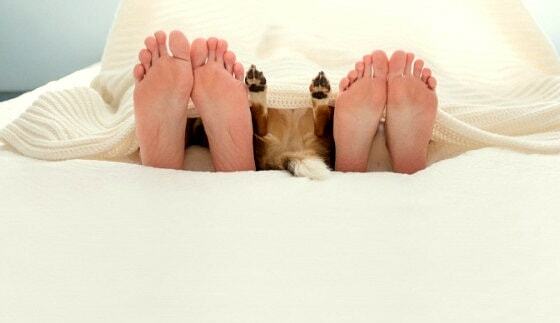 What a precious picture of the “family” under the blanket. Dogs are the greatest. They deserve lots of love and attention. Thanks for some other excellent post. The place else could anybody get that type of information in such a perfect manner of writing? I have a presentation next week, and I’m at the search for such information.